The post Cassandra Garbage Collector Tuning, Find and Fix long GC Pauses appeared first on AryaNet. Cassandra garbage collector tuning has been a hot topic of discussion in the Cassandra user mailing list from time to time. Users and administrators are required to gain some skills on how to properly tune the garbage collector for their Cassandra nodes so that they can avoid long stop the world pauses that can bring their cluster to halt. Although out of the box garbage collector settings work for most use cases, as the data volume and request traffic per Cassandra node increases, the demand for tuning garbage collector increases also. 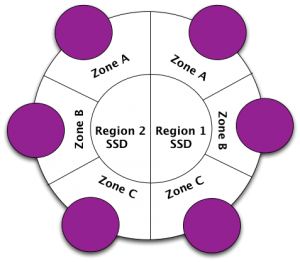 In this article I’ll explain how you can analyze your Java Virtual Machine and optimize its heap size and settings for your use case. Some of the techniques described here can be applied to tuning any application running on JVM, but majority of them only apply to the way Cassandra works. 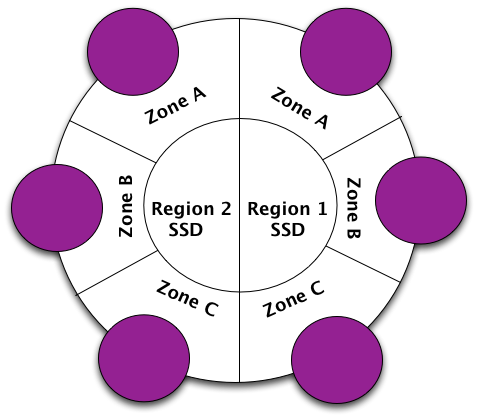 Since AWS has launched the beefy hi1.4xlarge instances with SSDs, and Netflix has published a great benchmark of Cassandra performance with them, they became very popular among Cassandra community, and I decided to go through the path of shrinking the Cassandra cluster to fewer nodes utilizing the power of these instances. The initial 24 node cluster was pretty much running with vanilla GC settings that shipped inside cassandra-env.sh. Due to the fact that the 6 nodes had to handle 4 times as much workload, Cassandra garbage collector tuning became important to me and I had to learn and change some settings so that the nodes can utilize the power of their beefed up hardware. These changes included several JVM settings, and at the end I had to actually increase the size of JVM Heap from 8Gb to a mighty 24Gb to maintain the low SLAs and 95th percentiles bellow 200ms. Your clients are timing out for a closed period of time. If you are lucky this period would not be bigger than a few hundred milliseconds, however by the time people usually complain, this period has gone beyond seconds which is a really bad behavior for the database layer. The only assumption I am making here is that these timeouts are due to Garbage Collector Stop the World pauses and not other issues such as CPU or I/O saturation. In my case I was able to produce a handful of multi-second stop the world GCs during my load test throughout a day. Hence Cassandra Garbage Collector tuning became a new topic of interest to me. When Garbage Collector Stop the World pauses are the culprit? The histogram in particular will be very helpful because usually at the time that you have long pauses, you want to see what objects are consuming most of the heap, and the histogram will provide you with the answer to that. 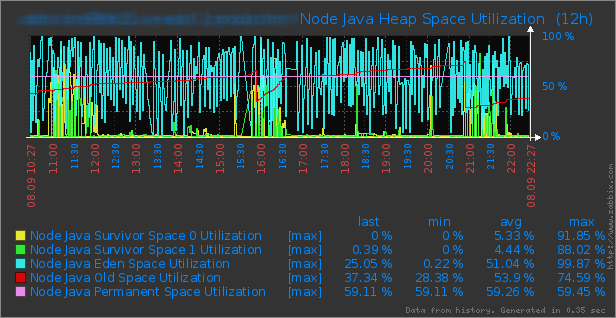 In the top graph we see that a little before 16:00 there is a sharp cliff in the heap space used. This means that CMS Collector kicked in. You can see that it kicked in around 6Gb heap usage which is 75% of total 8Gb. You also see another cliff before 21:00 which is deeper. The 75% is based on the GC flag which is set inside cassandra-env.sh as CMSInitiatingOccupancyFraction=75. It tells JVM to force CMS to run a full sweep if heap is filled up at least 75%. This process doesn’t always take too long. As you see in the bottom graph, only the first cliff caused a stop the world GC of about 15 seconds which is terrible, but the second one didn’t despite it being able to free up more space. Long pauses are usually caused by full GCs. And full GCs happen when CMS cannot collect enough objects concurrently hence it falls back to the Parallel algorithm, pauses and scans all objects in the heap. I’ll talk more about this later in the heap crash-course. Congratulations. You have just found out that you have a problem with super long GC pauses. Hence the rest of this article become relevant to you. I highly recommend you to read Understanding Java Garbage Collection which is really well written in my opinion as I am not going to duplicate this great article here. It will help you understand how the JVM heap is setup and how different GC algorithms work. Then head back here and I will walk you through scenarios that can cause Cassandra to have long GC pauses. Premature Promotions is when objects don’t live long enough in the young generation before they expire. This causes the ParNew cycles to promote them to the old generation. The more objects get promoted to the old generation like this, the more fragmented heap will get. As a result there won’t be enough room in old generation for young objects and ParNew will fail with Promotion Failure. The following graph shows the percentage utilization of different generations inside the heap space. The blue line which is like a saw, is the Eden space. On average 51% of eden is utilized which is normal. But if you look at survivor space utilizations, you notice they are utilized 5% on average. There is a cliff on the old space utilization before 16:00 which co-relates to our slow GC. This means that although the survivor spaces seem to be filled 50%, the old generation keeps filling up earlier than survivors. This means that there is opportunity to tune the young generation as we have a premature tenuring. Heavily loaded servers specially serving thousands of read requests can easily fall into this scenario. The large block specifically is a sign that there is a large object in the heap. By default Cassandra will run one compaction thread per CPU core available. During the compaction process, Cassandra will read each row at a time from all SSTables that it belongs to, it cleans up tombstones if they are expired beyond gc_grace_seconds, and sorts the columns and writes the row back into a new SSTable. It does this process all in memory up to the value of in_memory_compaction_limit_in_mb in cassandra.yaml which is 64Mb by default. Now if your NewGen size is 2Gb on a 16 core machine, you can have up to 64Mb x 16 = 1Gb of heap filled up with columns from compaction threads. Depending on how your compaction is throttled, these objects can live longer in heap and be quickly promoted to the old space causing it to get filled up. If you are running a high CPU machine with the default heap settings, this can easily hit you. It is hard to absolutely pin the problem to compaction but with instrumentation in Cassandra code you can make that conclusion. In this case we can see tons of these which shows compactions were creating lots of columns. Once you found compaction to be the issue, try throttling them down and in a high CPU machine, even reduce the number of concurrent_compactors from default to something like half the number of cores. In this case, this example CF could be the source of long row. Compacted row maximum size is 223Mb. If a client attempts to read this row entirely, there will definitely be a GC hiccup. The last two lines provide useful information as to how your clients are reading from this column family. Average live cells per slice tells that queries are usually reading 51 columns at a time which is good. If this number it above hundred, depending on the size of data stored inside your columns, you may have the problem and need to tune down your application to read lower number of columns at a time and paginate through. Key Caches are very useful, so sometimes people think that if they increase the key cache size portion of the heap, they can help their application. It is true and false. You can increase the key cache size to the point that you are occupying a significant portion of the heap. Since key caches can be long lived if you have hot rows, they can get promoted to the old generation fast. This also limits the amount of space available to other operations like reads, repairs, compactions, and memtables. There are 773Mb of long arrays and over 1Gb of byte arrays and over 15 million Key Cache objects which is in accordance with the number of keys that the cluster had. If you look at Cassandra Code , there is an assumption that keys are 48 Bytes (AVERAGE_KEY_CACHE_ROW_SIZE). This assumption is used to compute the size of key cache consumption in heap. You can quickly make a guess that if your developers have made keys that are longer than 48 Bytes, your key cache can easily use more memory than it should have without you knowing it. The best solution for this is to not have such a large key cache anyway. The default of 100Mb can hold a lot of keys if you are not crazy to have keys more than 48 Bytes. I usually advise my developers to not have keys more than 32 Bytes. Alternatively, you can disable the key cache entirely for the column families with large keys, or upgrade to Cassandra 1.2 as this issue (CASSANDRA-4315) is fixed. If you are using Row Cache and you are specially using the old ConcurrentHashCacheProvider, row caches are stored on the heap. For the very same reasons as the previous section, you may run into heap pressure and super long GCs. 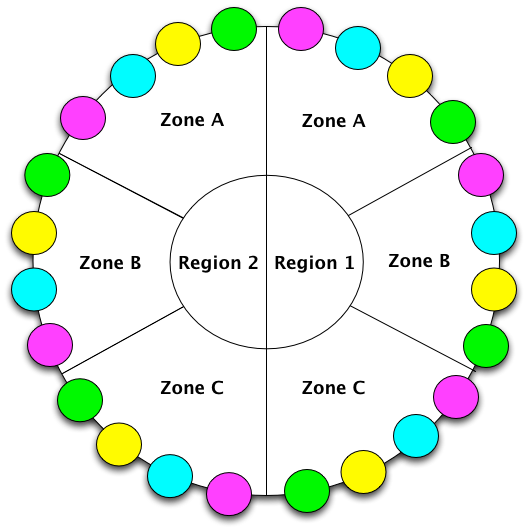 Therefore use SerializingCacheProvider or turn of Row Cache completely. If you have a write heavy workload, it is usually a good idea to increase the memtable segment of the heap because it absorbs more writes and leads to efficient compactions when flushed to disk. However, on a workload which has more reads than writes, if memtable space is large, it takes room away from heap for other purposes like serving reads. Moreover, if memtables aren’t flushed because the flush threshold is large, they have higher chance of being promoted to the tenured space. Usually when long GCs happen and Cassandra is under a heap pressure, MemoryMeter.java will output useful logs into system.log with details about how much cells where in memtables and from what column family. From that output you can decide if memtables are wasting your heap. In this scenario, you can reduce memtable_total_space_in_mb in cassandra.yaml. If you have a high write and read workload and you need to optimize for both, you may have to increase the heap size. Notice all object have age of 1. This mean these survived after one ParNew GC round. ParNew auto tunes itself. If it sees more long lived objects, it will increase the TenuringThreshold after each run up to the MaxTenuringThreshold. It it sees objects are expiring faster, it will reduce the TenuringThreshold. If you are unlucky like me you have to go to the final resort which some people hate in Cassandra community. You will need more room for your young generation but it is not advised to increase the young generation to more than 1/4 of the total heap size. In fact Java Hotspot won’t start if someone increases the young generation beyond 1/3 of heap space. You need to have larger old generation for healthy promotions. In this case gradually start increasing your heap size and young generation size to the point that you don’t go beyond 1/2 of your available physical memory. I recommend increasing the heap size by 2Gb at a time and adjust the young generation size accordingly. Keep in mind to keep your high value of MaxTenuringThreshold. The drawback of running Cassandra with larger heap is that your ParNew cycles may take longer but if you have more CPU it will not be a problem. The benefit is majority of your expired objects will be cleaned up in young generation. At the same time you will not super log stop the world pauses. The improvement can be observed quickly. From the Heap Utilization Graph you can see that the maximum heap size was increased to 24Gb and it is utilizing 10Gb on average. You can see the cliff in the graph which is a sign of CMS GC execution, but in the Stop the World GC times graph before 20:00 there no significant GC pause. However, you can see the average GC pauses have gone up a bit since ParNew is cleaning more space. 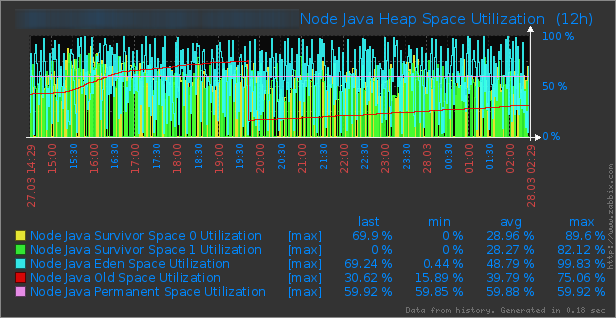 The Heap Space Utilization Graphs shows that the survivors are utilized 28% on average compare to 5% before. 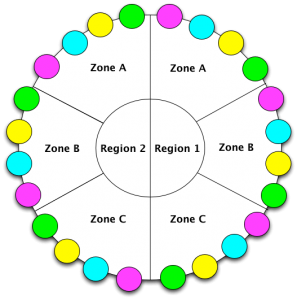 The post Shrinking the Cassandra cluster to fewer nodes appeared first on AryaNet.